At EVM we specialise in electric golf trolley technology, batteries and chargers, sales and servicing, repairs, cart bags and accessories. 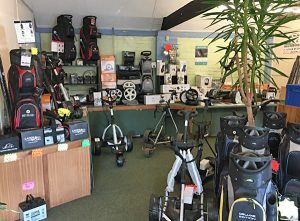 A family owned and run business for over 20 years, we pride ourselves on providing professional sales and servicing for almost every make of electric golf trolley currently available. Having established our business when powered trolleys were in their infancy, we have seen a great deal of change and evolution in design, and know not only the quirks and nuances of all electric golf carts we see, but also know the history behind the golf cart manufacturers, where to find their golf warehouses and also where to source the parts. We offer both a mobile service around Kent, and East Sussex, and also visit parts of West Sussex and Surrey by prior arrangement. Our rounds extend to golf clubs and golf shops across the counties reaching west as far as Ifield in Crawley, south as far as Seaford Head in East Sussex, and North as far as Deangate Ridge near the Hoo Peninsula. Our fundamental business model has remained the same: if you have a broken electric trolley, or are looking for trolley repairs, then you have found the right place to get to know the people in the know. Visit our shop in Headcorn, Kent, or contact us and arrange for us to come to you. Browse our selection of new and reconditioned electic trolleys or check out our list of spares.